It's been a while since we last took a look at an All-In-Wonder video card; in fact, it is back in November when Chris Newman evaluated the ATI All-In-Wonder 9600 PRO. Not surprisingly he was mightily impressed by the all-round package that is the All-In-Wonder technology. Initially, ATI released the All-In-Wonder 9800 PRO costing around $449, which to the average consumer is well above what the majority of consumers are willing to pay. So, ATI came back with the All-In-Wonder 9600 PRO, which bought multimedia capabilities to the mainstream. It also fixed the minor niggle with the AIW 9800 series, which did not officially support multiple monitors. Recently, ATI announced that they had added a 9600 XT-based board to the All-In-Wonder range. This new release was featured in our recent CinemediaPC project that was seen on The Screen Savers TV show back in May 2004. 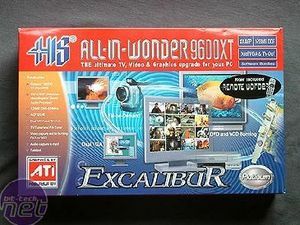 The actual specification of the All-In-Wonder 9600 XT's graphics processor is identical to the 9600 XT's, with the exception of the AIW 9600 XT's core being clocked 25MHz higher. By rights, this shouldn't make an awful lot of difference as the board only features 4 rendering pipelines and a 128-bit memory interface. The performance on paper is certainly not outstanding, but it falls right in to the mainstream market, where we're not expecting high resolutions coupled with Anti-Aliasing and Anisotropic Filtering in the most graphic-intense game titles on the market. It is made out to be a mid-range card that is jam-packed with features - we'll see if it holds true to this over the coming pages. Is the credit crunch getting you down and there's no hope of you ever stretching out for that GeForce GTX 295? We take a look at the HIS HD 4670 IceQ to find out if this overclocked, custom cooled version of ATI's budget card can offer decent performance without denting your wallet. Stay frosty people!